When life’s circumstances take you on an emotional roller coaster ride, how do you obey the Bible’s call to “be joyful always” when it sounds almost crazy—and out of reach? Bible Gateway interviewed Stasi Eldredge (@StasiEldredge) about her book, Defiant Joy: Taking Hold of Hope, Beauty, and Life in a Hurting World (Thomas Nelson, 2018). What’s the difference between “joy” and “defiant joy”? Stasi Eldredge: The answer is an easy one. Joy means to have great pleasure or delight. In this world we find ourselves living in, having joy in the midst of it often feels both crazy and out of reach. That’s why we need to possess a defiant stance. Defiant means to stand against the tide. It means to go against the flow that’s comprised of a strong current of despair and difficulty. Believing that sorrow and loss don’t have the final word takes defiance. To have joy in the midst of pain or the current newsfeed can seem impossible. What do you mean when you write that, rather than denying the truth of reality, defiant joy is being fully present to it? Stasi Eldredge: Being fully present to our lives will mean feeling our sorrow or pain or happiness or whatever we’re in the midst of and living with a heart rooted in the deepest reality of the goodness of God and the life that’s coming to us. To live with an authentic and defiant joy will mean engaging our lives fully, but interpreting them by the highlight of Heaven. God is not present in our pretending that our lives are not what they are. He’s present in moments, even when our moments are a very hard place. The invitation from God is to encounter him in our here and now with an honesty and a trust that he will meet us. Why do you say Christmas is an invasion and how does that pertain to being joyful? Stasi Eldredge: The incarnation of Jesus was a rescue mission for mankind. Planned long in advance, God came into the Earth to save us—much like a military unit will sneak into an enemy camp to rescue captives. We were all captive to sin, and Jesus came under the cover of night, to the little town of Bethlehem, to perform the greatest rescue mission ever. He invaded our world that had fallen under the power of the evil one to victoriously triumph over evil! How has writing this book helped you in your personal battle with depression? Stasi Eldredge: Writing Defiant Joy has caused me to check in with my own soul every day to ask myself what I’m believing. My thoughts are either based on the truth of the gospel or not. I have a choice to make when I find my emotions have plummeted and that is to turn my gaze to the truth that I’m endlessly loved. My emotions may not instantly rise, but my soul can rest in God and I can experience being rooted in joy. Stasi Eldredge: Jesus asks us to drink the same cup that he did. It was a cup of suffering—one that the Father asked him to drink. Though we’ll never suffer as Jesus did, he asks us to take up our cross and follow him. The cup Jesus drank was a doorway to life. Death led to the resurrection. Sorrow led to joy. The ways of God are higher than ours, but in Christ and because he led the way, the cup of suffering becomes the cup of joy for us just as it did for him. 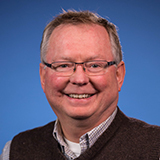 How should a person struggling to have joy approach the Bible? Stasi Eldredge: Ask the Holy Spirit to reveal the truth about who God really is and who you are in him. Ask him to show you what your joy is to be based upon. I’d begin by spending some time in Ephesians 1 and asking God to reveal the truth to you of how deeply loved you are. Stasi Eldredge: The primary key that unlocks joy is gratitude. Having a thankful heart is the ground in which joy flourishes. We can cultivate gratitude by remembering the goodness and faithfulness of God in our own lives and in the Word of God. If a person is in a season where being thankful feels completely out of reach, then I suggest they begin by thinking of things they like and making a list. Simple things as in, “I like coffee. I like the smell of freshly mown grass. I like sunsets…” After making the list, thank God for those things. It’s amazing the affect a shift in our thoughts can take. 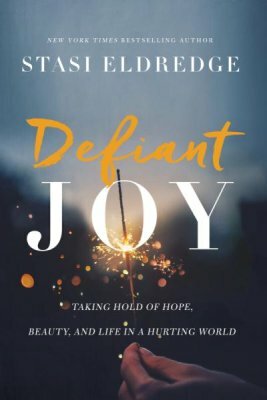 Stasi Eldredge: I want people to read Defiant Joy and find understanding, mercy, and hope in it. My desire is that it reveals the love of God more deeply and awakens their joy as their response. I find so much joy and awe in the fact that God is singing over me. He’s rejoicing over me every day even when I blow it or am not living as well as I’d like. His love is unchangeable and unconditional. Hooray! Stasi Eldredge: Bible Gateway is FANTASTIC. It’s such a huge help in finding Scripture, looking up meanings, parallel verses, diving deeper, and being encouraged. It’s an invaluable tool that I personally use often. Plus it has articles that bring truth and encouragement as well! It’s something that everyone should be aware of and make use of! Stasi Eldredge: God is a God of joy. It’s at the very center of his being. His command that we be joyful always means that it’s both possible for us and that he wants it for us. The invitation is to come to know him better. Because when we do, our joy will increase and be rooted and grounded in his unending, immeasurable, boundless love. Defiant Joy is published by HarperCollins Christian Publishing, Inc., the parent company of Bible Gateway. 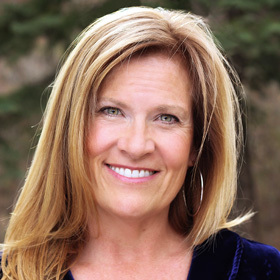 Bio: Stasi Eldredge is a New York Times bestselling author of such books as Captivating: Unveiling the Mystery of a Woman’s Soul and Becoming Myself, and her books have sold nearly 3 million copies and changed women’s lives all over the world. A teacher and conference speaker, Stasi is the director of the women’s ministry at Ransomed Heart and leads Captivating retreats internationally. Her passion is to see lives transformed by the beauty of the gospel. She and her family make their home in Colorado Springs, Colorado. Find joy in your Bible study by becoming a member of Bible Gateway Plus. Try it free for 30 days!